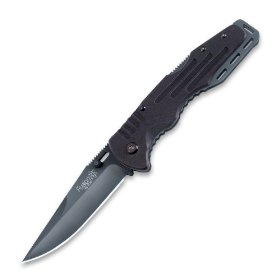 SOG Fusion Salute is a tactical folding knife for everyday use. Blade is straight edged with black oxide finish, and handle is made of highly durable G-10 with stainless steel liners. Locks securely with lockback. Overall length: 8.25". Weight: 4.2 oz. Fusion Salute (Black Oxide) FF-11 For our first Fusion tactical folder we wanted something that was progressive and performance driven. The Salute is an acknowledgment that great design can still be affordable with a little perseverance. Take the machined G10 handles in combination with scalloped full-length steel liners for a whole new look. Add a big lockback, smooth as silk operation, and a proven Bowie style blade. For good measure, throw in our patent-pending new invention- a movable thumb stud so you can tailor the position to your own hands. We didn’t forget to incorporate our trademark low carry bayonet clip either. The Salute lives up to its name and is worthy of carry on any front in the world… including your back yard. This item is NEW in the manufacturer’s original packing and covered under the manufacturer’s warranty.